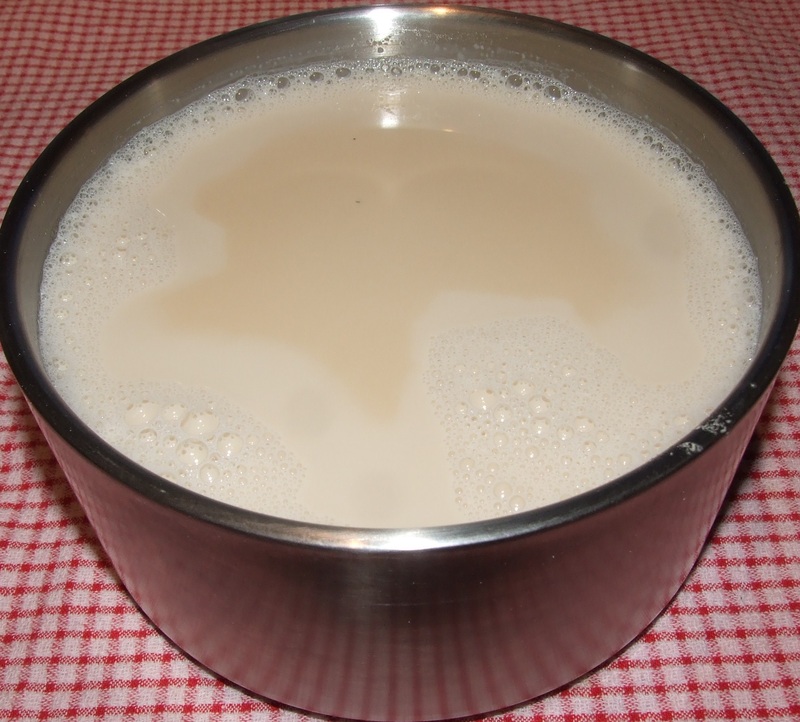 “There is nothing more delicious than a fresh batch of homemade soy milk. The soybean has its origins in China. One of the world’s most versatile beans, it is used to make countless items as faux meats, tofu, tempeh, miso, and soy sauce. Soybeans contain all eight amino acids, and they are very high in Vitamin B, protein, and calcium. Soybeans are also a fabulous source of lecithin, which is typically known as brain food. In a large bowl, cover the soybeans in 6 cups of water. Make sure they are submerges completely. Set aside and leave to soak overnight. When beans have finished soaking (about 8-10 hours), drain out the excess water. In a kettle or small pot, bring 3 cups of water to a boil. Pour into a large stock pot. Repeat twice with the remaining 2/3rds. Add 7 cups of cold water to the bean puree. Place half in TM bowl and cook for approximately 8 minutes at 100 degrees on Reverse speed 3. Make sure you switch off as soon as the temperature reaches 100 degrees. Repeat with other half of mix. Once cool enough to handle, strain the mixture through a cheesecloth or metal strainer into TM bowl. Discard the pulp. Transfer into pitcher and refrigerate. Stays fresh for 5-7 days. Makes just over 2 litres. Place 1/3 of the soybeans in high speed blender or food processor with 1 cup of boiling water and blend until pureed. Add 7 cups of cold water to the bean puree and slowly bring to the boil on medium heat, stirring continuously. Once boiled, remove from heat immediately, cover with a lid, and set aside to cool. Once cool enough to handle, strain the mixture through a cheesecloth or metal strainer into a pot. Discard the pulp.